In 1984 I was working on the South coast of Crete at Kommos Excavations during the summer dig season. The dig team, comprised of Canadian and American archaeologists and graduate students, had breakfast all together early in the morning before work began, and then dinner all together in the evening after the day’s work was over (and after our requisite gin and tonic time). We sat at a long set of tables in the narrow, treed courtyard of the dig building that housed the dig kitchen. There were two full-time, local women who cooked for the team. They were an institution there, despite being very screachy, and irritable. They always had a handy spray-can of ByGone (a DDT laced insecticide) in the kitchen, that they used to keep the flies away. They used it regularly on our food, particularly the butter/margarine. The food wasn’t always the best (I remember one goat stew that still had fur attached to the meat, and another night we ate small snails that were gritty with sand) but dinners were always accompanied by lots of local wine and lots of laughter. One night we were all having our dinner when a couple of tall bearded men showed up and asked to talk to the Director of the dig. They were ushered to the head of the table and introduced themselves. One of the men was Tim Severin, a noted British explorer and historical researcher. I had read a couple of Severin’s books and knew about what he did. He followed in the steps of Thor Heyerdahl by recreating ancient sea vessels and then sailing them along ancient routes that were known from myths and legends. 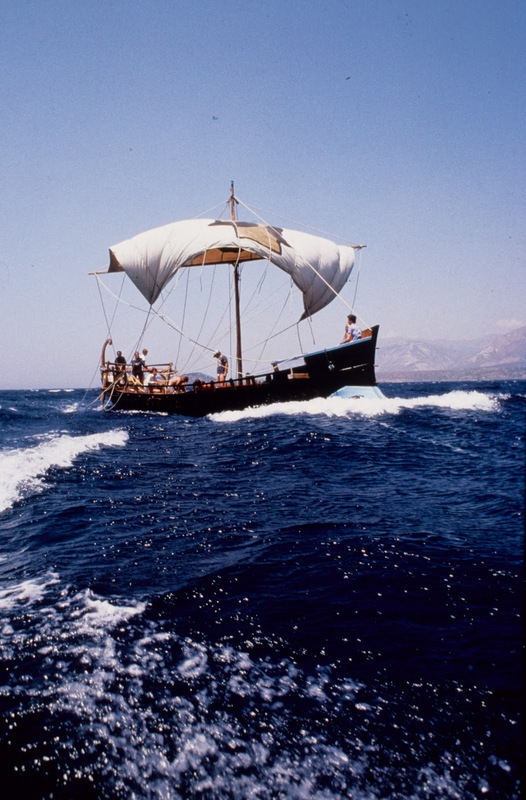 He and his crew had just arrived at Kommos bay with a replica Bronze Age ship, and they wanted to invite all of us to visit on-board, and to talk about the local archaeological sites and their connection to Homer’s Odyssey. Kommos has a beautiful natural harbor that was used for millennia. The ruins that we were working on dated from ca. 1800 B.C. to ca. 200 AD. During the Minoan period (ca. 1800 B.C. – 1200 B.C. 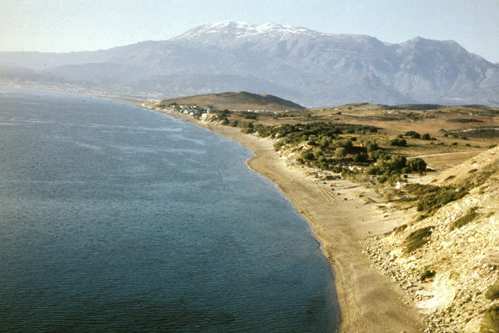 ), the site was an active port and even had a wide paved road that connected the site to a network of palaces on Crete. On one occasion, several of us went out with the Director of the dig to snorkel and dive in the sea just off-shore from the excavation, to locate an ancient anchor * that was known to exist. It lay there on the sandy bottom and was easily visible, once it was located. The ship decorated for the Ulysses journey. The ancient anchor was very near to the same spot that the replica ship was now anchored. It was a glorious site to see a Bronze Age style ship floating on the “wine dark” sea (an epithet from Homer describing the sea: οἶνοψ πόντος, oinops pontos) in the natural harbor. 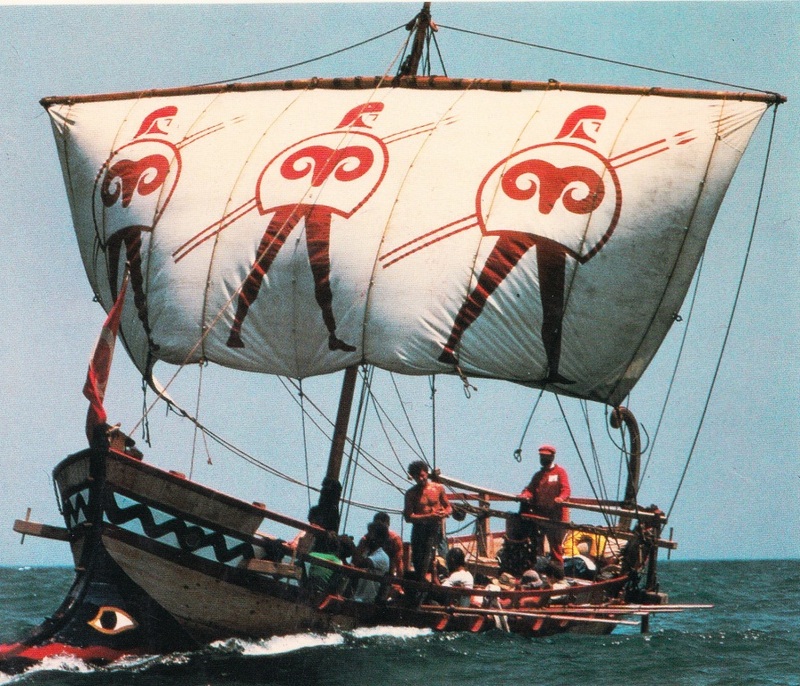 The replica boat was made proportionally smaller than the ones that sailed during the Bronze Age, and therefore also had a smaller crew. Severin had built this ship and had named it The Argo for a previous voyage that followed the path of the mythic Jason to Colchis, an ancient land located on the Black Sea. There, according to legend, Jason found the golden fleece and the princess Medea, and brought them back to Greece. The ship decorated for the Jason journey. The ship was now being re-purposed to retrace the journey of Ulysses (the latin name for Odysseus) from ancient Troy back to Greece. In Homer’s great saga The Odyssey, Odysseus encounters many obstacles along his way home to Ithaca, including being ensnared by a witch, Sirens, a Cyclops, and lotus eaters. Severin used this boat to follow the natural currents and shorelines of the Mediterranean to hypothesize where Odysseus and his crew met with adventures along their journey home from the Trojan War. The modern crew was comprised of men from all over Europe. Many were Scandinavian and didn’t speak English. All of us, from the Kommos crew, went out in our bathing suits to the boat, and sat on the deck of the small ship and shared some wine with the crew, while the dig Director and his wife (also a noted archaeologist) spoke with Tim Severin. Severin believed that Kommos was the harbor that Ulysses (Odysseus) came to after his time in the land of the Lotus Eaters. He believed that the Lotus Eaters were located in what is known today as Libya – just south of us, across the Libyan Sea. And that is where they had just sailed from. Severin and his crew only stayed a couple of days and then were off to trace the rest of the mythical journey, and we went back to our routines at work. Severin’s voyage may not have been the most scientific of projects, but it captured the romance of the Homeric texts and stirred the imagination. I used to love swimming in the waters of Kommos bay, after our work hours were over. I especially enjoyed floating with my toes pointing towards Africa and letting the even waves wash over me. It was easy to let go of everything when I was floating there with nothing but the deep blue waters, the huge blue sky and the rugged cliffs and rocks of the coast. I was easily swayed to believe that Odysseus visited Kommos during the Bronze Age – why not? * the anchor was published in 1995. “Two Three-holed Stone Anchors from Kommos, Crete: their Context, Type, and Origin,” IJNA 24: 279-291. 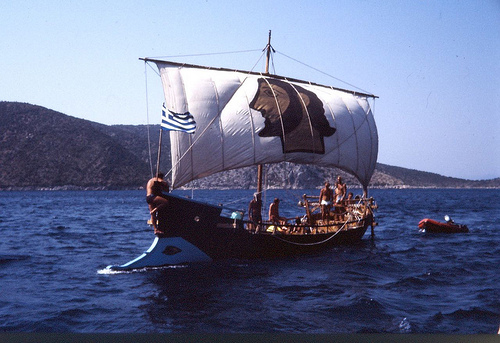 This entry was posted in Betty Safran Malyon, Uncategorized and tagged Ancient Greek Boat Replica, Kommos, Kommos Bay, Kommos Excavations c 1984, The Odyssey, Tim Severin by Elizabeth Malyon (née Safran). Bookmark the permalink. Thanks for this interesting read. 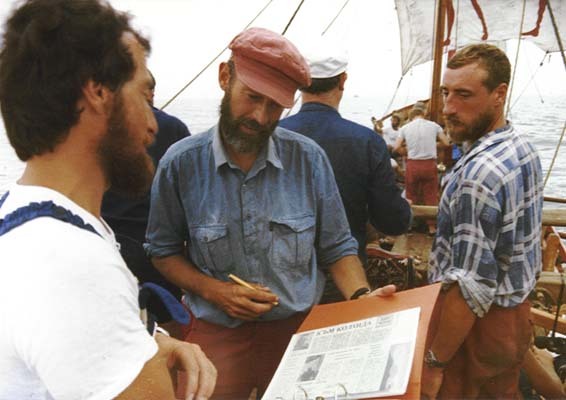 I have known about Tim Severin for years, as I’ve always been interested in the Brendan voyage and actually went to the little cove where Brendan supposedly sailed from in Ireland (in Dingle). Here are a photo or two of that spot.